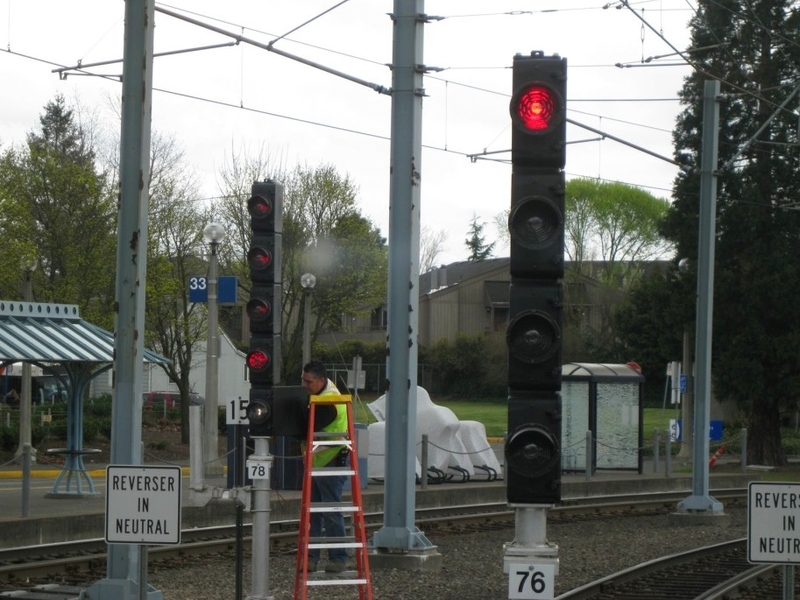 Westbound trains were delayed Friday due to a switch issue by Beaverton Transit Center. 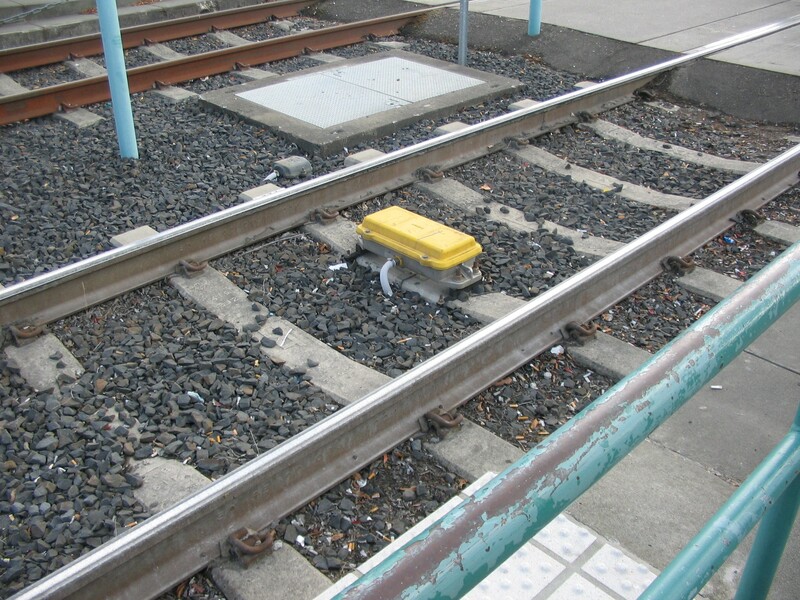 There are three power switches to get into or out of the pocket track from the east, and the one farthest to the left in that picture was not throwing properly, so rail supervisors were on scene to manually throw the switch and direct trains safely through the area. I was off work and downtown when all of this was going on and from what I could see the operators were doing everything they could – getting on the PA to announce the reason for the delay and apologize for the inconvenience. Surprisingly, given how backed up everything was, no official service alert was released. Of course, people weren’t happy about the delay or being stopped for a while only to proceed up to the next platform and then stop again. Things were very backed up – this conga line of trains at every platform on Morrison is the result of that issue way out by BTC. If you look closely, you can see there is a Type 4 up at Galleria, then another train at Pioneer, then this train next to me at the Mall/5th platform, and another train behind it at 3rd/Morrison. A common complaint I was hearing was that passengers didn’t understand why the trains were stopped where they were – can’t they keep moving, even if slowly? There are a couple of reasons why trains were holding where they were. One: stopping away from platforms is something to avoid whenever possible. 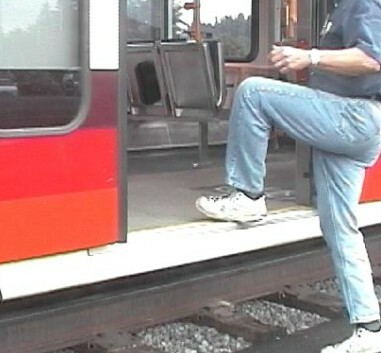 Passengers can get a little agitated and uncomfortable being on a train that isn’t moving, and it’s dangerous for them to pull the emergency door release to leave the train away from a platform – first because that can likely put them in the path of a train coming in the other direction or vehicle traffic (depending on your location), and second because even the low-floor train cars have a drop to the ground if you’re not at a platform. So it’s preferable for stopped trains to hold at platforms with their doors open or on release which allows people to leave the train safely. The direction of travel is from left to right. 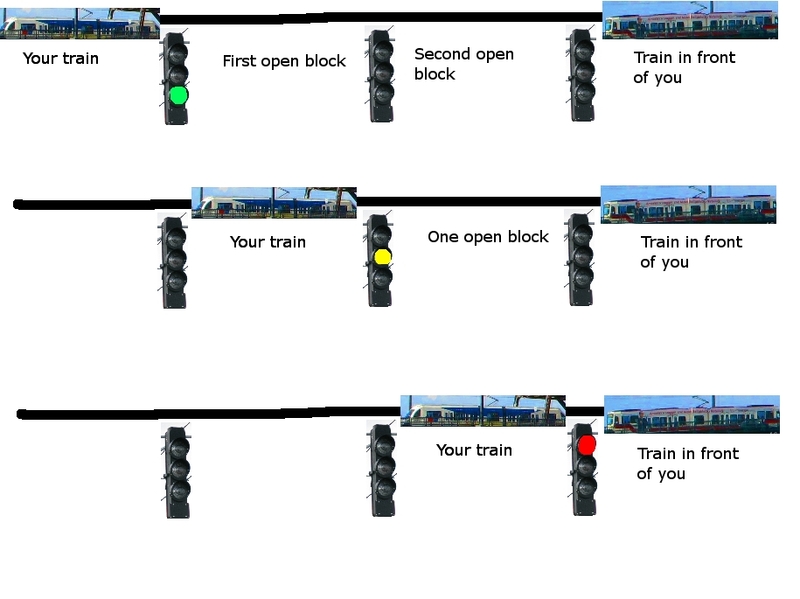 On the top part of the image, a green signal indicates that there are two open blocks (that is, the space between the signal in front of you and the signal after that one, AND the space between that signal and the one after it both are clear of trains). 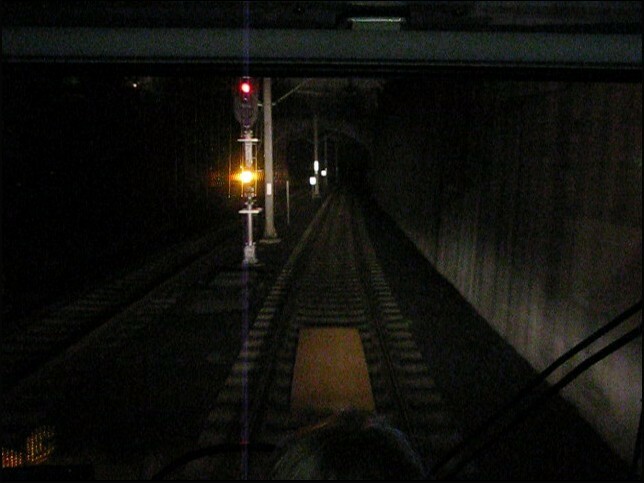 In the middle part of the image, the yellow signal indicates that there is one open block between you and the train in front of you. The bottom part with a red signal indicates that the train in front of you is in that block. If the block in front of you is occupied, you CANNOT proceed into it. The block system and associated ATS magnets work to keep the trains spaced at a safe distance and prevent collisions. So even though there appears to be more than adequate space for all of these trains to have rolled through downtown and waited behind each other on the alignment just east of Beaverton TC to proceed through, multiple trains cannot safely occupy the same ABS block. Additionally, since it’s safest to have the trains holding at platforms whenever possible, it’s better to have the trains stacked up here than at each ABS signal along the west side where there is no safe way for people to exit the train if they’re not at a platform. A pause in the signal series, because it was getting too difficult to write about the last type without having explained ATS first. 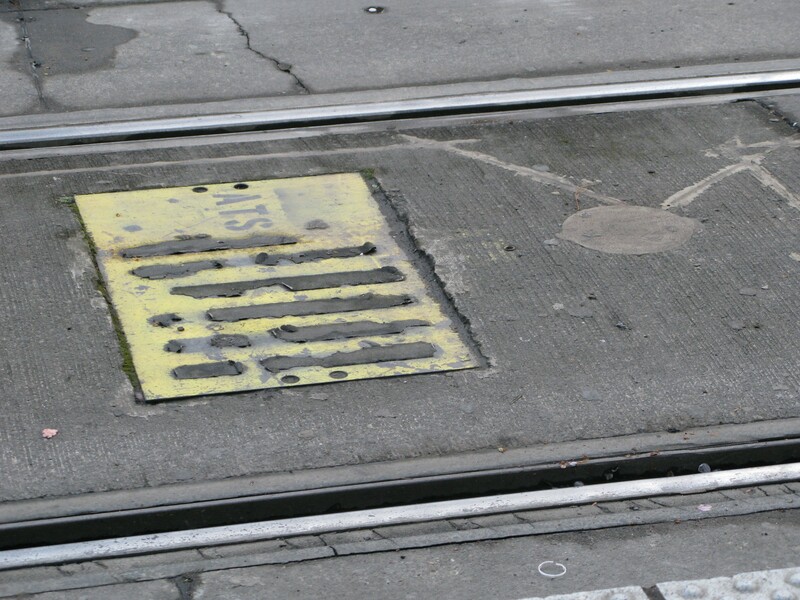 These little yellow rectangles are found all throughout the alignment, much to the delight and happiness of rail operators. These are the ATS (automatic train stop) magnets, and given their name it’s pretty easy to figure out what they do. If a train goes over one while the magnet is active, the train automatically comes to a stop. They are associated with every signal capable of displaying a red aspect, and will be active as long as that signal is red. So, by default, a train physically cannot run a red light – attempting to do so will bring the train to an irretrievable stop. ATS magnet and red signal aspect, Sunset TC westbound. 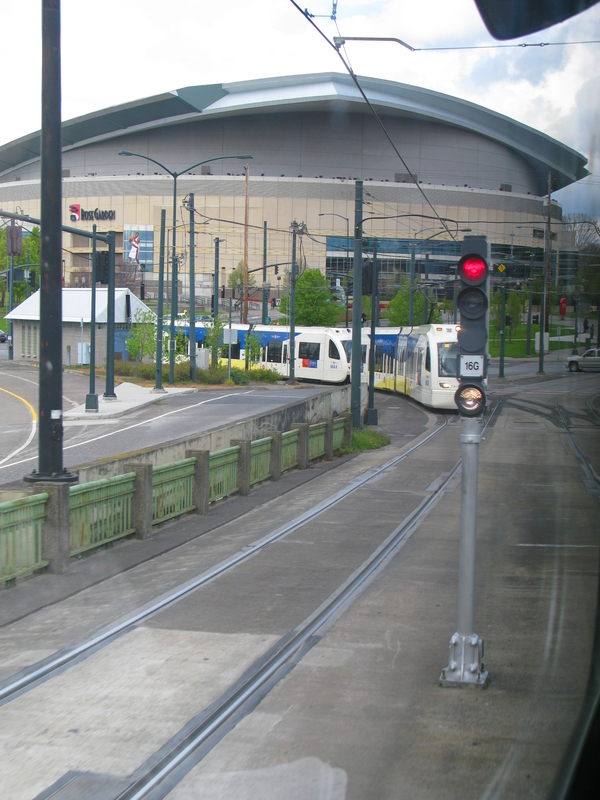 ATS magnets are also located in areas where it is really unsafe for a train to speed – for example, coming into Gateway TC from any direction because of how busy it is, or the single track that goes into PDX International Airport. These “speed trip” magnets have a pickup a set distance away from the magnet depending what the speed limit is, which activates the magnet for as long as it would take a train going faster than the posted speed limit to reach. 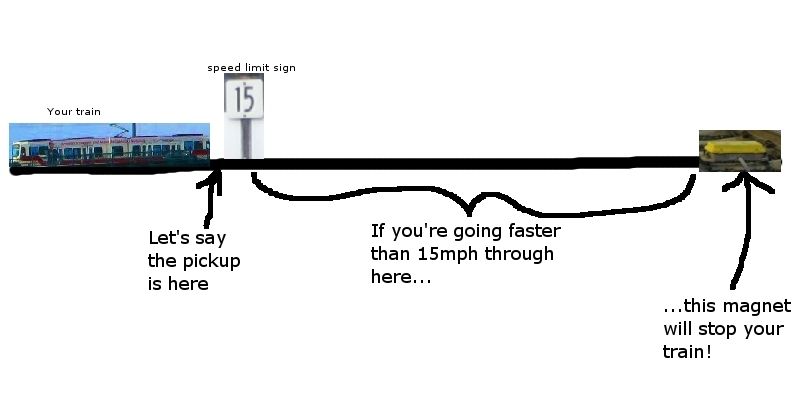 So with a 15mph magnet, for example, if a train is doing 16mph when it goes over the pickup and doesn’t slow down, when it goes over the magnet it will trip it and come to a stop. And again, the operator will have paperwork to fill out and explaining to do, because any type of ATS trip – from running a red or speeding – is a rule violation. More or less how ATS works for speed – let’s say that distance takes 30 seconds to cross if you’re going 15mph. If you operate a train through it and it only takes you 25 seconds, you’re speeding, and that magnet will stop you. Although new operators especially don’t like the magnets since it’s hard to remember the speed limits of all parts of the alignment at first (and therefore easy to get tripped! ), they are an extremely important safety feature and it’s a very good thing that they’re there – they prevent collisions in ABS territory (which covers all high speed areas) because a train will come to a stop at the red light, long before getting close enough to the train in front of it to hit it. And they prevent derailments or other accidents in areas where speeding would be extremely dangerous. I’ve mentioned “ABS territory” in the last few posts – most of the alignment is in that category. 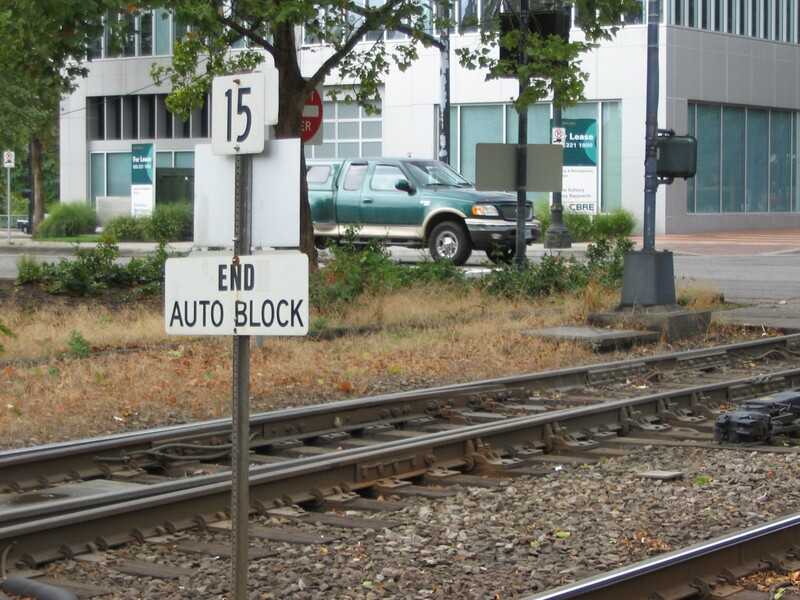 In ABS territory, trains have a dedicated right of way and intersections are protected by crossing gates. 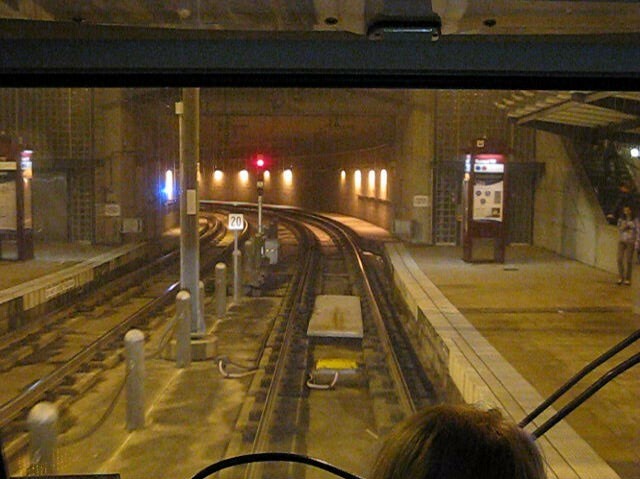 Westside Blue Line – 12th & Washington westbound through the tunnel is ABS territory. Goose Hollow westbound also is ABS. And for the Blue Line – Ruby Junction and points east. All ABS signals and combination signals (more on that in a later entry in this series!) are numbered to make them easy to identify and for operators to use when reporting their location to Rail Control. 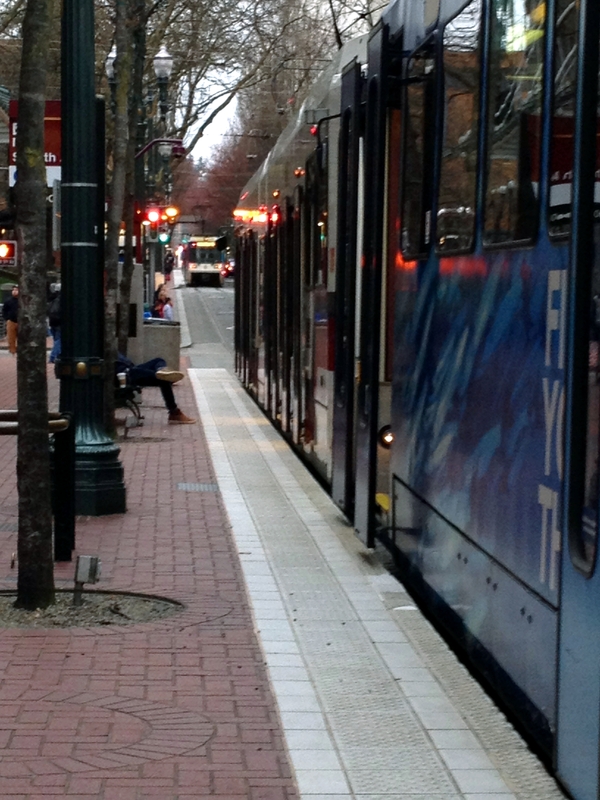 On the Blue, Red, and Yellow lines, signal numbers correspond to their distance from the 11th Ave terminus downtown. And point of trivia (not like this whole blog isn’t trivia, but whatever) – most eastbound main signal numbers end in 4, most westbound main signals end in 6. The signals east of the 11th Ave terminus on the Blue Line alignment have no designating letter, but the signal numbers increase as you head east from 11th Ave, and the numbers give you an estimate of their mileage from the 11th Ave terminus up to Signal 160, which is used by trains leaving the tail track into the Cleveland Avenue platform. The numbers of signals west of 11th Ave terminus all begin with W and go up to W1778, which is one of the signals to leave Hatfield Government Center, nearly 18 miles from 11th Avenue. Signals along the Yellow Line alignment from Interstate Rose Quarter through Expo Center begin with N2A and N2B, and go up to N62 at the Expo Center, a little over 6 miles from the 11th Ave terminus (I know these maps aren’t perfect, they’re just to give an idea of location and distance). 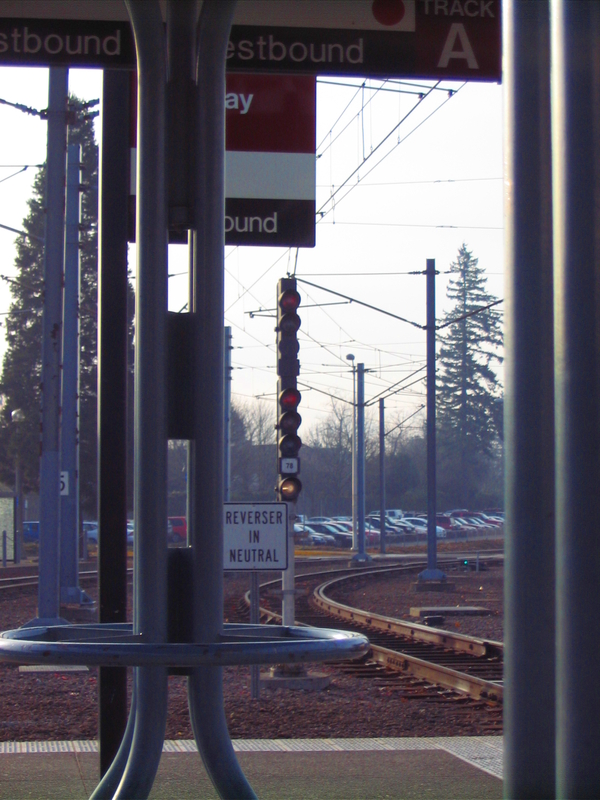 On the Red Line airport alignment, the signals begin with A – the lowest number is A88 (which is visible to trains heading into Gateway) and they go up to A552 which is one of the two platforms at the PDX Airport Terminus. These numbers don’t relate to the distance from 11th Ave terminus – they correspond to the distance from Gateway, which is about 5 and a half miles away. 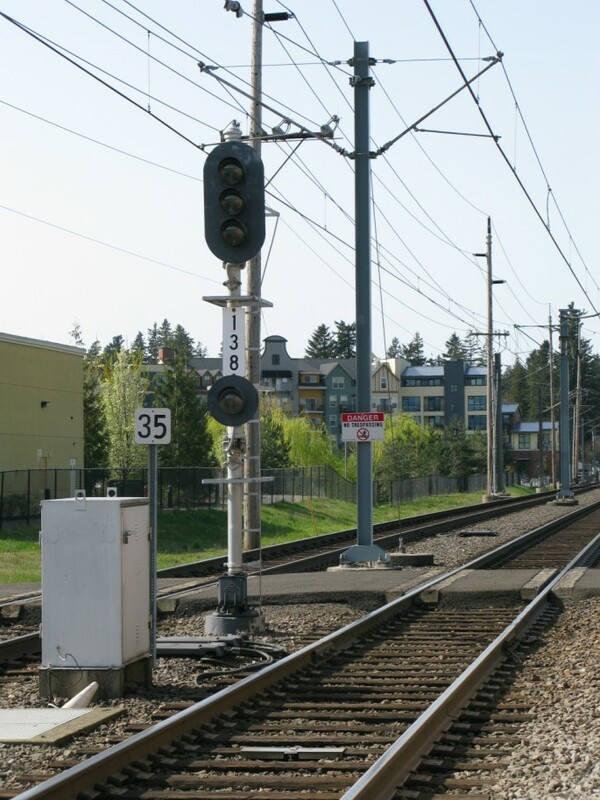 Signals along the Green Line alignment to Clackamas Town Center begin with C. These go from signal C14 near Gateway where the Green Line diverges south up through signal C630 which is the tail track signal at Clackamas. Again, like with the Red Line Airport extension, these numbers correspond to the distance from Gateway rather than the distance to 11th Ave. 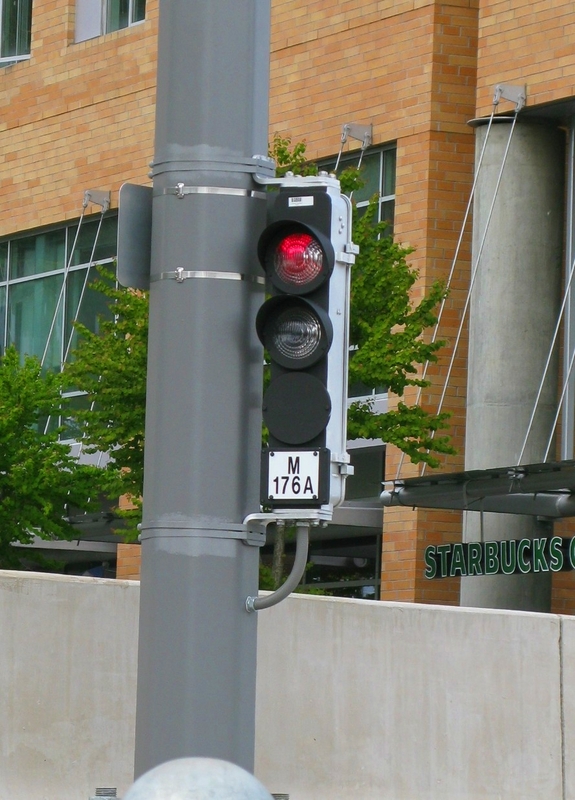 The ABS and combination signals on the downtown mall begin with M, beginning with the M176 signals in the Jackson turnaround and going up to the ABS & combination signals near Union Station and on the Steel Bridge (M16 is the lowest signal number at the Steel Bridge). That pretty much covers ABS signals I think… up next, pre-empts! “But wait,” you might say, “What do you mean by ‘primary route’?” Or maybe you didn’t say that, but we’ll pretend you did. One of the neat things about ABS signals on the MAX alignment is that the number of aspects of it that are lit tell you what route you are going on. One aspect lit (as in the signals shown in the last post) = primary route. 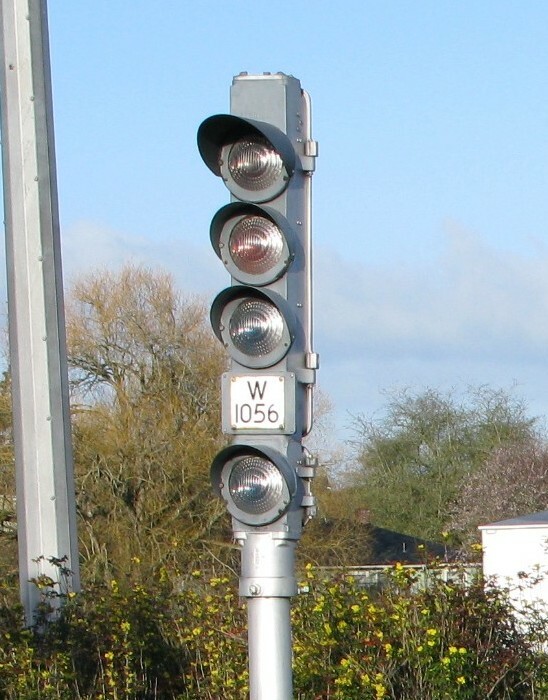 Two aspects lit, as seen on this two-headed signal = secondary route (the top head is red, the bottom head which is separate from the top is yellow). 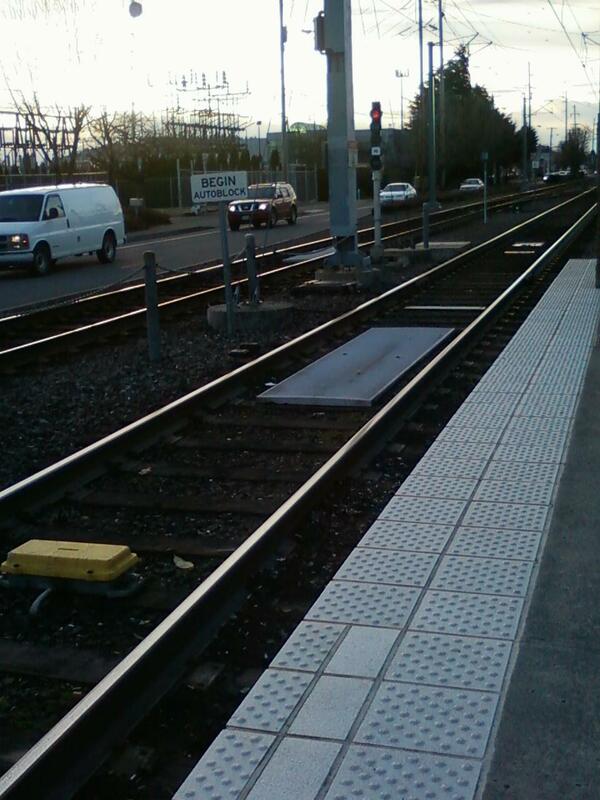 Here, at Elmonica/170th platform looking east, the secondary route diverges a train into the yard for the night. In other parts of the alignment, the secondary route can diverge a train from the Steel Bridge towards the Expo Center, into the Red Line terminus at Beaverton Transit Center, the airport alignment from Gateway etc. 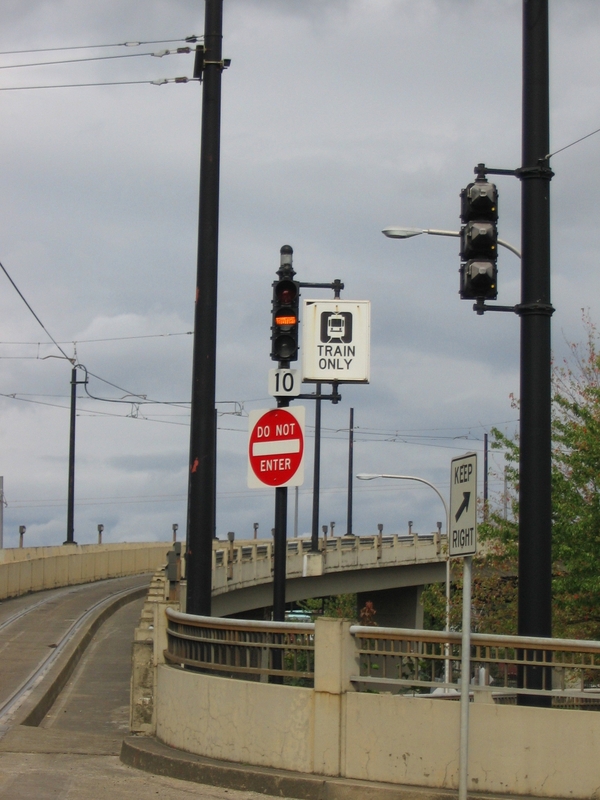 This picture was taken onboard a Yellow Line train coming off the Steel Bridge and heading towards the Interstate/Rose Quarter platform – note how the signal number separates the two signal heads. We’re not in ABS territory here, but this signal tells us that the switches are set for heading north towards the Expo Center (the secondary route) instead of heading east towards Gresham (which would display just a single lunar aspect for the primary route). 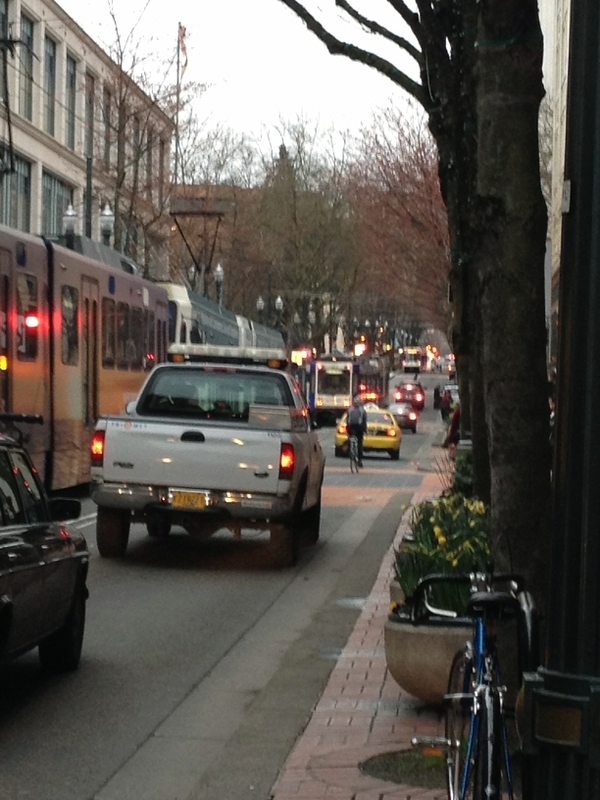 The above picture is old (and low quality, I used a camera phone) – taken before the Green Line to Clackamas alignment was tied into Gateway. 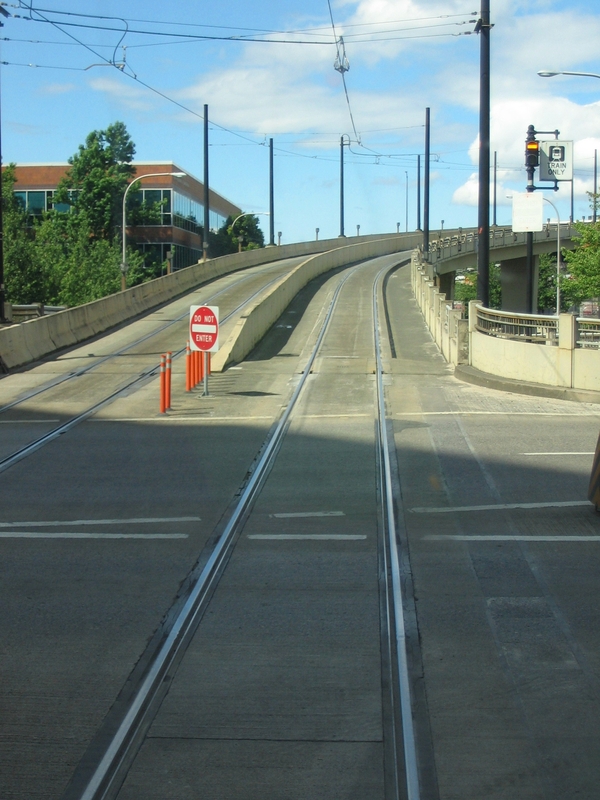 At the time this picture was taken, only two routes were possible from the eastbound main track at Gateway – continuing onto Burnside and Gresham (primary route) or diverging to the Airport alignment (secondary route). Now there are four routes possible from this track so signal 76 looks different and is pictured below in this post. 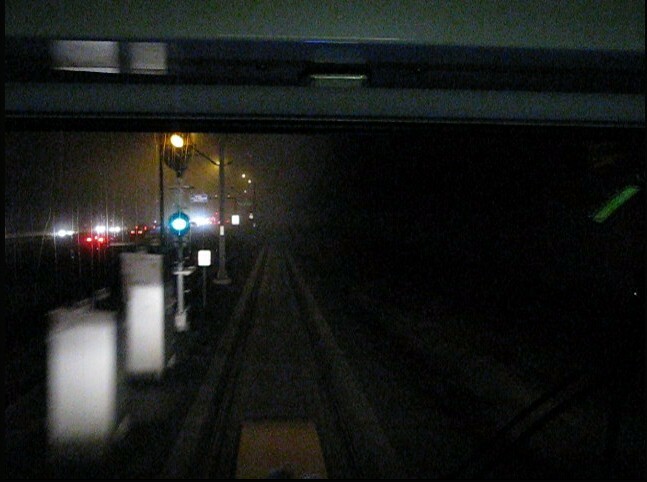 Anyway, this is a picture of the signal aspects that an airport-bound train got: a red over a green. This indicates that they are clear for two ABS blocks on the secondary route. It’s also possible for this signal to display a red over yellow, which would indicate to the airport-bound train that they were clear for only one ABS block on the secondary route. An airport train will still get a red over a green (or yellow), but it looks a little different on the new signal 76. 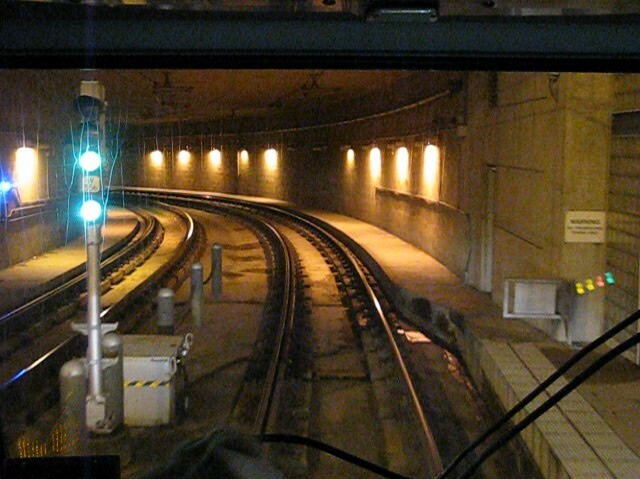 W556 is the only signal on the alignment that can display a green over green aspect. The indication of this is “advanced advanced secondary route” – meaning that not in the ABS block between this signal and the next, and not in the block after that, but the block after THAT diverges to the secondary route. Basically the top aspect tells you how much further on the primary route you are going to go before you diverge; and the bottom aspect tells you that you are going on a secondary route. This is the signal at the end of the block that started with the green over a green at Sunset. This is a yellow over a green, indicating “advanced secondary route” – meaning that not in the ABS block between this signal and the next, but in the block after that the train will diverge to the secondary route. So you will be continuing one more ABS block before you diverge. W716 is the signal at the end of the block that began with W616. And similar to what you’ve already seen, this red over yellow aspect on signal W716 indicates that in this ABS block, before the train reaches another ABS signal, it will diverge to the secondary route. So you will not be continuing on the primary route for any more ABS blocks (that’s why the top aspect is red) – look for switches that will change your route before you see another ABS signal. So if one aspect = primary route, two aspects = secondary route.. then if three aspects are lit? You guessed it – the tertiary route! And this is what signal 76 looks like nowadays – all aspects are on the same head. So it’s not my favorite example of showing three aspects (elsewhere in the system signals capable of displaying more than one aspect have them all on separate heads which is easier to understand), but this is a train eastbound at Gateway that is diverging onto the tertiary route, which is the Green Line extension to Clackamas. This indication is “Clear for 2 ABS blocks on the tertiary route” – notice how you are not continuing any further on the primary or secondary routes (both of those aspects are red), but you will be clear to continue for 2 ABS blocks on the tertiary route since the third aspect is green. 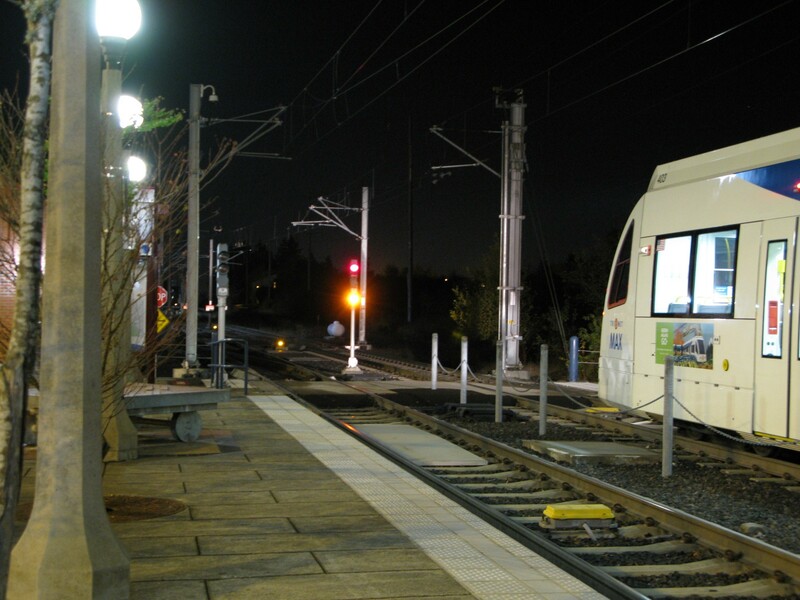 This is an old picture (this particular signal at Gateway was also replaced for the opening of the Green Line) but it shows the 3 heads lit, indicating a move to the tertiary route, which at the time this picture was taken brought the train to the auxiliary track at Gateway. This bad boy replaced that above signal. I don’t know enough Latin to say what the proper names for the 4th and 5th routes would be (quarternary, pentinary? 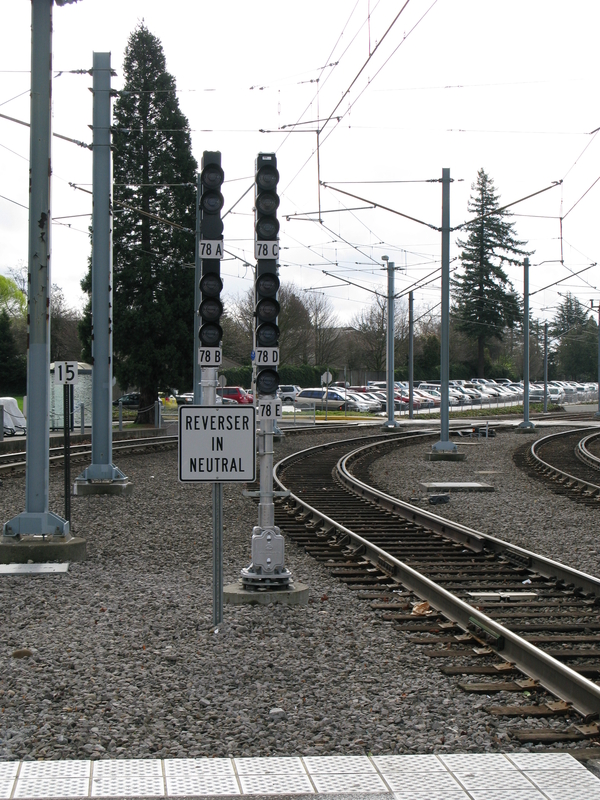 ), but Signal 78 is the only one in the system that will display a 5th diverging route. Briefly this signal was designed like the new signal 76 (both pictured here as they were working on them), but they changed it to this design – I believe there had been stability issues and concerns about wind knocking it down with all the aspects on one head. 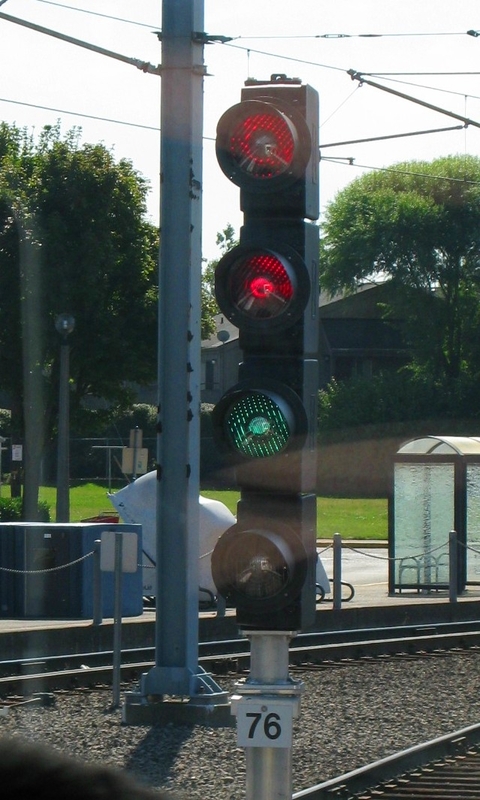 When more than one aspect on a signal is lit, the more restrictive color is ALWAYS above the less restrictive color (the only exception is Sunset’s green over green) – reds will always be over yellows, greens, or lunars, and on signals indicating advanced diverging route, yellow will always be over green.